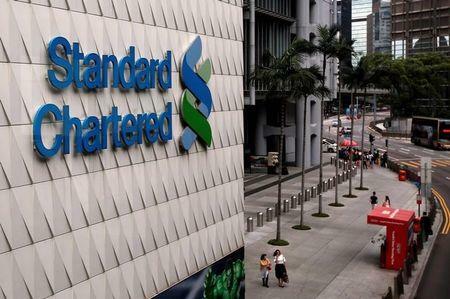 HONG KONG (Reuters) - Standard Chartered <STAN.L> is parting ways with three senior Asia-focused bankers and possibly with some mid- and junior-level bankers, as the British lender moves ahead on a plan to cut costs and revamp its industry coverage, two sources said. The senior bankers include Hong Kong-based Toby Groser, who is the co-head of general industries group in Asia focussing on retail and consumer sectors, and Dominic Richards, head of Asia media and telecoms coverage, the people said. Singapore-based Nikhil Nath, the other co-head of StanChart Asia general industries group, is also leaving the bank, said the people, who declined to be named as they were not authorised to speak to the media on the subject. The bank's costs grew 7 percent in the first half of this year versus a year ago, and the higher expenses from investments aimed at improving performance have been a concern for its shareholders. The move is part of StanChart's drive to trim coverage focus in areas that are more heavily dominated by its U.S. and some European rivals, and build on its strong client base in sectors including oil and gas as well as metals and mining, they said. "We have done a strategic review of our GIG (global industrial group) business and we retain dedicated sector banker coverage at a global scale for industries where we have the greatest impact for clients," she said in a statement. The three bankers did not immediately respond to Reuters' emailed requests for comment. Simon Cooper, StanChart's CEO of corporate and institutional banking, and global head of banking Paul Skelton have been driving those changes to accelerate its revenue growth. Both are former HSBC Plc <HSBA.L> bankers and joined StanChart in 2016. Steven Cranwell will assume Venkat's role in addition to his responsibilities as global head of commercial real estate.